The end is getting near to the "Create an eye makeup look for each of the NYC Expert Last lip lacquers" challenge that I started in early October, as I only have two lip lacquers left. This time, it is the turn of the shade that I think is the prettiest: the NYC Expert Last lip lacquer 500 - Rockaway Ruby. It has a gorgeous, deep classic red color without any orange tones. Although it is such a beautiful color, it was also one of the trickiest colors to create an eye makeup look for. Since it is so eye catching, any eye makeup look can easily become too much. I also had to set myself the limitation that I could only use the eyeshadow colors of the two eyeshadow palettes: Clio All That Eye Styler Kit 1 and 2. I intended to force myself to get more uses out of them, but during the way, I also learned to be more creative in my eye makeup looks (I even tried the smokey eye look for the first time!). 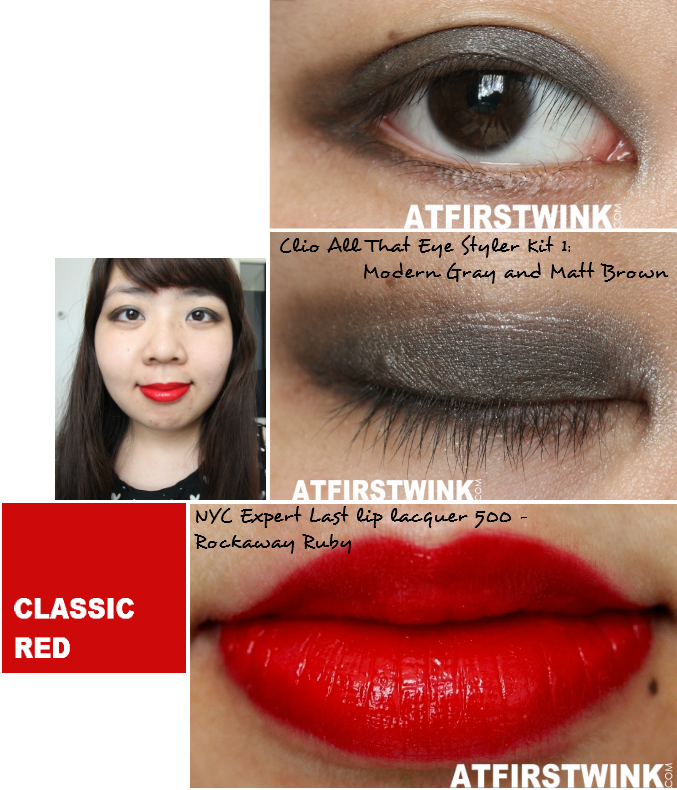 Although I am not completely satisfied with it, I managed to create this Classic Red makeup look. On my lips, I have the NYC Expert Last lip lacquer 500 - Rockaway Ruby. It feathers easily, so apply it on the inside of your lips first and use the leftover lip lacquer on the applicator to color your lip line. On my eyelid, I started with applying the eyeshadow shade, Modern Gray (note: I didn't spell this wrongly, this is the actual name), from the Clio All That Eye Styler Kit 1. In my previous swatches, I applied it very lightly and you could see the blue tones better. After building it up more, it turns more dark grey (see first row of pictures). Underneath, you can see how I applied the eyeshadow shade, Matt Brown from the same eyeshadow palette. It is a matte brown eyeshadow, with which you can easily create a smokey look. However, it is a bit difficult to smudge and it can look a bit patchy.